ELEVATE YOUR BLACK HILLS EXPERIENCE ON AN ATV OR UTV. Enjoy the great outdoors of the Black Hills National Forest on an ATV! Hundreds of miles await you—over 3,600 miles of open roads and over 650 miles are designated trails for all types of Off Highway Vehicles (OHV) and include 21 trailheads. Visitors can rent ATV/OHVs from five local providers to explore the Hills on their own or bring your own ATV/UTV. If you bring your own vehicle, a motorized trail permit is required to use the trail system and 7-day or annual passes are available for purchase on-line or in-person at the following: any Black Hills National Forest Service office, the Black Hills Visitor Information Center in Rapid City or at the Hill City Visitor Information Center. Explore the Hills from a unique perspective, on a friendly horse with experienced guides and wranglers! 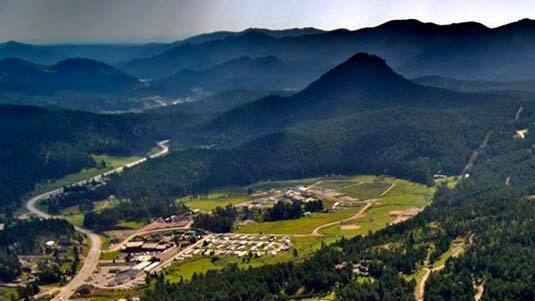 Peace, beautiful scenery, rugged terrain and even a night under the stars can be yours as you enjoy the outdoors and miles of trails in South Dakota’s beautiful Black Hills. Outfitters that offer horseback trail riding excursions will offer a memorable experience that will make you want to come back for more. Recreational enthusiasts of all types will enjoy the finest in outdoor exploration along the George S. Mickelson Trail, named after the SD governor who championed its existence. Stretching 109 miles from Deadwood to Edgemont, the trail passes through Hill City, the “Heart of the Black Hills” and offers some of the most spectacular views found anywhere. This crushed limestone/gravel surface is perfect for those who want to hike, bicycle, ride horseback, snowshoe, run or cross-country ski. Fifteen accessible trailheads with self-serve trail pass stations make it easy to jump on and experience the finest of what The Hills and Mother Nature have to offer. Hiking is a favorite pastime of many visitors to The Hills. If it is yours, you will be rewarded with jaw-dropping spectacular views, the serenity of a waterfall or steam, and maybe catch a glimpse of a mountain goat, wild turkey or an elusive elk. Hill City is your perfect launching point to hike the George S. Mickelson Trail or the many trails located in and around Custer State Park and the Black Elk Wilderness. The Hill City Visitor Information Center carries a wealth of trail maps and guides to help you start your unique journey.